Welcome to our Weber Genesis E-310 review. Now, for many people forking out $700 on a gas grill would sound like madness when there are much cheaper models available. However, the universe has given us a rule that states “you get what you pay for.” This is certainly applicable in the case of this beautifully constructed gas grill. So, is it worth the investment? Are there any pitfalls that could be a deal breaker? Let’s discuss the Weber Genesis E-310 in depth. 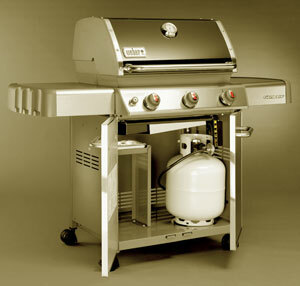 Oh, please have a look at the new Weber Genesis II range as well. Let’s see if all these features add up to a high-quality, effective grill that is worth the price tag. This is a heavy product, with the box weighing close to 200 pounds. You can see why once you open it and inspect the parts. This is heavy duty construction. Welded square tube stock frames the panels. Thick stainless steel. If you’ve ever owned a cheap made in China grill, the Weber will seem like a beast from another planet. All the parts fit together well. I’d recommend you use a socket wrench as the included tool is not quite up to the task. If you have loads of patience you can probably get by though, but it makes sense to do a proper assembly right from the start. The instructions are easy to follow and everything has its place. Assembly should take between one and two hours. It’s a little time-consuming, but not difficult by any standards. Everything about this grill feels like quality. Even the knobs have a pleasant, thick quality feel to how they turn. The E-310 features a crossover electronic ignition that is powered by an AA battery and works like a charm. You may rightly be concerned about the 38,000 BTU on a 507 square inch cooking surface. Well, turns out BTU isn’t everything if you have the design quality right, although a little extra oomph wouldn’t have gone amiss. 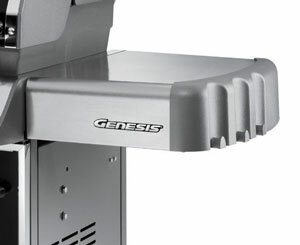 As it is, the Genesis E-310 gets to 500+ degree heat in 10 – 15 minutes, which is decent enough. You can cook using both the direct and indirect method on this grill. You can even push it to 600 degree plus temperatures and have them fairly steady as well. Heat distribution is where the Genesis models really shine, and the E-310 is no exception. We’ve seen how, with cheaper brands that have a lot more BTU, all that extra heat is useless if it’s not spread evenly around the cooking surface, or if it gets lost through poor design. With the Weber Genesis E-310 there are no such issues. There aren’t cold spots and you can control the heat distribution beautifully from the front control panel. The even cooking is also one of the most frequently highlighted perks of the Genesis series once you start doing some research. One small drawback perhaps is that the flavorizer bars are porcelain-enameled and not stainless steel, so they may wear out faster than stainless steel would. Still, they’re easily replaced and not expensive, plus Weber covers them with a 2-year warranty. There is no doubt that Weber rules the roost when it comes to quality. You can always raise the valid issue that their cooking surfaces are smaller on a dollar for dollar basis than some of their competitors, like Char-Broil, but there is just no comparison to be made between the quality of craftsmanship and materials used on a Weber. I’ve carefully watched the ratings for this grill over the last 3 or 4 years and they remain consistent. 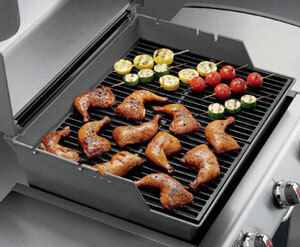 With many cheaper grills, the ratings tend to go down over time as issues with failing parts and rust become apparent. You just don’t get that steady downgrading with this grill, or with most other Weber products. In fact, the Amazon rating for the E-310 has gone up from 4.7 to 4.8 stars in the last year. Also see our comparison between the very popular Genesis and Spirit models from Weber. The Weber Genesis E-310 is the best value in the Genesis range if you don’t need the searing burner or side burner that you get with the E-330 model. It has a very efficient heat design and cooks perfectly evenly. It is plenty hot enough for steaks, but if you really want to push the envelope and cook at 650+ degree heats, you may be pushing this model to its limits. Overall, this grill is well made, beautifully designed, built to last and it cooks like a champ. Four years on since the first time I reported on it, it is more popular and trusted than ever.